A FREE barbecue was enjoyed by more than 100 patrons at the Bushy Park War Memorial Swimming Pool on Saturday. 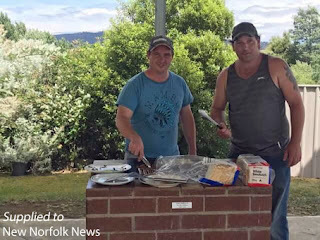 The sausage sizzle was provided by the pool committee following the late and interrupted start to the season at the pool. Councillor Paul Belcher said the council had apologised for the inconvenience caused by the recent breakdown in the pool’s filtration system and the committee was looking forward to the next couple of months of summer. The pool will offer free entry and a free sausage sizzle on Australia Day, January 26.